Ocean Systems Rackmount is quieter than ever with Whisper Technology. 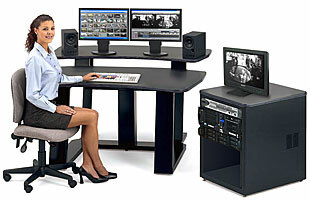 The Rackmount™ is a professional rack-mountable solution, not simply a tower solution turned on its side. As such, all ports and bays are fully accessible and in their proper orientation. Sturdy, compact and clean with thick gauge steel construction this system will install easily into any standard 19" rack cabinet. Positive Pressure Ventilation - ensuring components inside are cool. Sliding Rack Rails - providing you easy access. Security - Transparent, lockable "Front Access Door" which secures power and peripheral access. Security - Optional removable boot drive for classified editing.